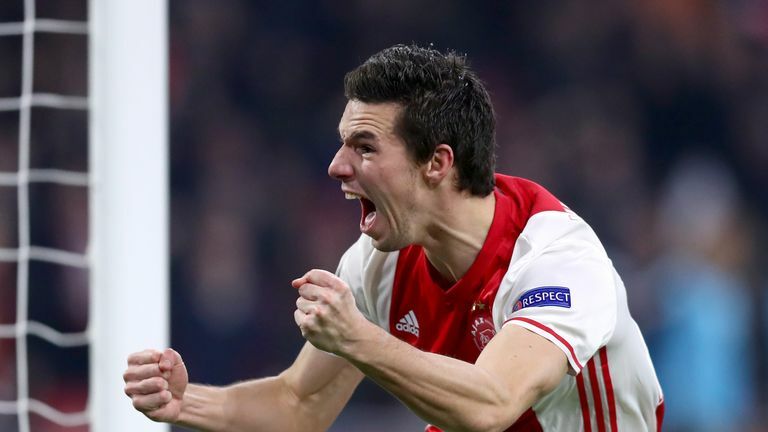 A lone strike by unlikely hero, Nick Viergever four minutes into the second half of a tense and tight 2nd leg at the Amsterdam ArenA ultimately proved enough to earn Ajax passage into the last 16 of the UEFA Europa League at the expense of reigning Polish champions, Legia Warsaw. The two sides came into the return leg locked at nil-nil despite the four-time European champions having had a perfectly good goal ruled out in the eighth minute of their initial encounter when skipper, Davy Klaassen’s volley from just outside the box appeared to be fumbled over the line by Legia ‘keeper, Arkadiusz Malarz. However, with referee, David Jose Fernandez Borbalan unsighted and unable to call upon goal-line technology for assistance, the hosts escaped and the score remained goalless ahead of the return match in Amsterdam. With Kenny Tete suspended following his dismissal in the opening match of this round of 32 tie and Daley Sinkgraven also missing for Peter Bosz’s side, Joel Veltman and Jairo Riedewald were the only changes from the eleven that took the field a week earlier in Warsaw, while Bosz also named Ajax’s recent €12 million signing, David Neres on the bench for the first time for the hosts. With just one win from four since returning from a lengthy winter break and Miroslav Radovic missing through suspension, Legia coach, Jacek Magiera opted to leave Czech striker, Tomas Necid on the bench in favour of playing a more compact formation with Michal Kucharczyk effectively operating as a ‘false nine’ in an effort to keep things tight in light of the Polish champion’s defensive frailties in continental competition thus far this season – Legia having taken up their place in the round of 32 by virtue of finishing an unlikely third in a UEFA Champions League group containing Real Madrid, Borussia Dortmund and Sporting Lisbon despite having conceded a whopping 24 goals in the process. Magiera’s tactics served to stifle the flow of proceedings in a largely uneventful opening period with the host’s best and only real goal-scoring opportunity of note falling to Moroccan maestro, Hakim Ziyech – whose low drive from just outside the area twenty minutes in found its way through a cluster of legs before striking the foot of visiting ‘keeper, Malarz’s left hand upright with Legia centre half, Michal Pazdan forced to scramble the rebound away from the feet of the lurking, Kasper Dolberg on the edge of the box. Having endured a frustrating opening forty five minutes, the hosts stormed out of the blocks after the break and hit the front four minutes into the second half – Nick Viergever – having been handed a more attacking role on the left due to the absence of Sinkgraven, finding himself in the right place at the right time to tuck away the tie’s opening and ultimately decisive goal after Malarz could only palm a low Amin Younes drive from just inside the area into the 27-year-old’s path. However, despite commanding the majority of the ball, the hosts failed to assert their authority thereafter, leaving the tie poised on a knife-edge. Yet, with Legia fully aware that a single away goal would swing the result in their favour, the reigning Polish champions – who currently trail league leaders, Lechia Gdansk by five points in the Ekstraklasa, could only fashion one real goal-scoring opportunity of note – Kucharczyk drawing a smart near-post stop from the host’s largely untroubled ‘keeper, Andre Onana seven minutes from time. Deep into added time, the home side did almost find a second. However, despite boasting a five on one advantage, Ziyech contrived to squander the opportunity to ensure Ajax’s place in the round of 16 – the Moroccan hitting the ball weakly at a grateful Malarz after being played in by Chelsea loanee, Bertrand Traore who, seconds earlier, had led the length-of-the-field break after visiting substitute, Thibault Moulin’s effort had been charged down on the on the edge of the host’s area following a Legia corner. In the end, Peter Bosz’s side – who, following AZ Alkmaar’s drubbing at the hands of Lyon, are now the sole Dutch representatives in European competition, didn’t require a second goal to seal their place in the last 16 of the competition where they will now face reigning Danish champions, FC Copenhagen.